Why Iron Cowboy Is So Important. When he started, no one thought he could do it: Complete 50 Ironman distance triathlons in 50 states in 50 days. But he’s done it. And in doing so, he’s changed our concept of what is possible. 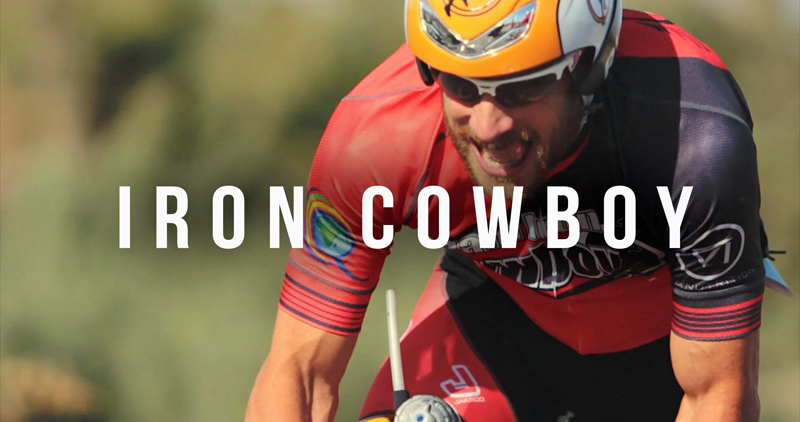 He is James Lawrence from Utah, 38 years old; The Iron Cowboy. Ironman has become a tattoo, a brand and an object of conspicuous consumption. A logo on a warehouse club fleece jacket bought after a race. Before that, back on a beach in Hawaii on February 18, 1978, it was something else. And thanks to Iron Cowboy, it gets back to its roots of pushing through barriers rather than stopping at them to buy a logo-ed jacket and get a tattoo. Iron Cowboy ran straight through all the marketing. Knocked down the barriers. He reminds us that Anything is Possible. And he did it without the licensing fees and waiting lists. He really Just Did It. The finish line is also tomorrow’s start line. It really isn’t over when it’s over. It’s only over when we stop. Ironman built it, and we bought it. Until The Cowboy, it had gotten stagnant, the needle stuck at 140.6. There are longer races, there are harder races; Marathon des Sables is one. But without the mega promotion and the TV deals and the brand licensing they have remained off the everyman’s radar. Iron Cowboy ran around the outside of the licensing fees that have been attached to the use of any reference to The Full Distance and made a mockery of dots and “M”s and tattoos. And in doing so he undid, in 50 days, what has taken nearly four decades to do. He reminds us that human limits exist only in our minds. That, unless we continue to push our concept of limits, that wet blanket we call “impossible” begins to settle heavily over us. When Ironman Hawaii started it was also thought to be impossible by some, injurious by most. Now finishing Ironman is commonplace. It isn’t easy, but it is common. So The Cowboy just raised the bar. And while Ironman, just one, lowly Ironman done in good conditions after months of training, good nutrition and careful tapering, is somehow made “smaller” in context by James Lawrence, the “Iron Cowboy”, it also remains a significant challenge. But now we are reminded that there are many accomplishments beyond the finish line at Ironman, and that there is much more to our capabilities than logos or tattoos. James Lawrence, 38 years old from Utah, completes 50 consecutive Ironmans in 50 days in 50 states on July 26, Sunday. Thank you Richard- for reading and especially for your correction Sir. I went back in and edited that. Appreciated. I mostly agree. I abhor the licensing opportunity taken by a certain company that puts on a lot of races. I cringe a little at the really loud jackets, but I understand – people are really proud when they finish a 140.6 as well they should be. What the Iron Cowboy did is laudable. It’s amazing. It both defines and defies human capability. But it in no way diminishes anyone else’s effort in completing a single, supported 140.6 race. When it comes to this statement “One of the things he demonstrated is that we’ve been pretty lazy, pretty complacent, somewhat petty …..in our approach to Endurance sports. We just want the tattoo. And fleece jacket. And hat. And bumper sticker. And license plate. And bike number. And…” The dots represent the comment about consumer-ish which I totally agree with but anyone who has gone that distance knows that complacency and laziness are not part of the equation and if a person wants to let others know what they’ve done then that is their right. I have far more trouble with people who think they are ‘somebody’ or better than others or more committed than others because they chose to commit to 140.6; and no, I am not talking about Iron Cowboy who shows no signs of feeling superior to others – his quest seems pretty personal to me. Anyhow I think training for and racing 140.6 is one of the most self indulgent things a person can do. It’s a choice, just as the choice to spend one’s time and money serving others is a choice. All legitimate, all worthy of celebrating. No judgement.